View the latest updates on Delicatefade.com for Natalie Grant below. Natalie Grant A Chord Chart Request has been answered for the song Power Of The Cross. Natalie Grant Some new Song Lyrics have been added for songs on the album Love Revolution. Natalie Grant Song Lyrics have been added for the song You Deserve. 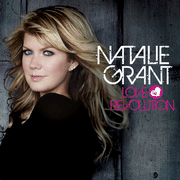 Natalie Grant Some new chord charts have been added for songs on the album Love Revolution.